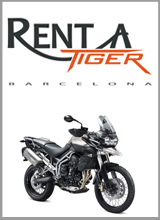 Just to say a big thank you to Anton for the great service provided by Rent a Tiger. We did a 7 day tour of Spain/Pyrenees/France from 5th to 11th June, and the bikes were faultless the whole trip. Anton is a great bloke to deal with and the service provided before an after the rental was excellent. As a recommend to anyone else hiring or for that matter heading to Spain for a ride check out the N330 from Almansa to Teruel...283km of twisty road with hardly any traffic...bike heaven. Owned a number of bikes... Yam FS1E, Kwaka triple, Honda VF750, Kwaka 650/750 four's, Triumph T140v, Suzuki Bandit. current bike is a 2009 Kwaka Z750.... loved them all.